Daylight is lingering each day a few beats longer. The view outside my window is now laced with green. Santa Fe is distinctly glorious. Ah, but you're here for the food. Forgive me for waxing all warm weather blooming trees poetic on ya. 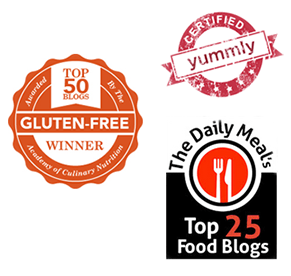 Here are some lovely Spring-into-Summer recipes for your gluten-free baking/cooking/eating pleasure. A classic or two. Or six. What's on the menu? A drink made of strawberries. 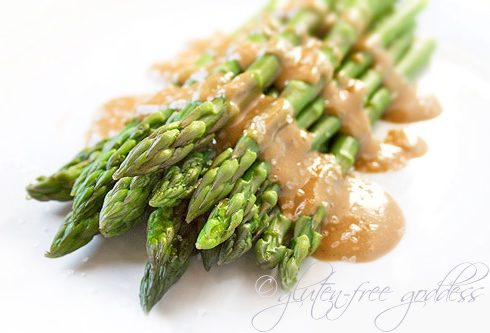 An appetizer of tender-crisp asparagus with maple-tahini dressing. 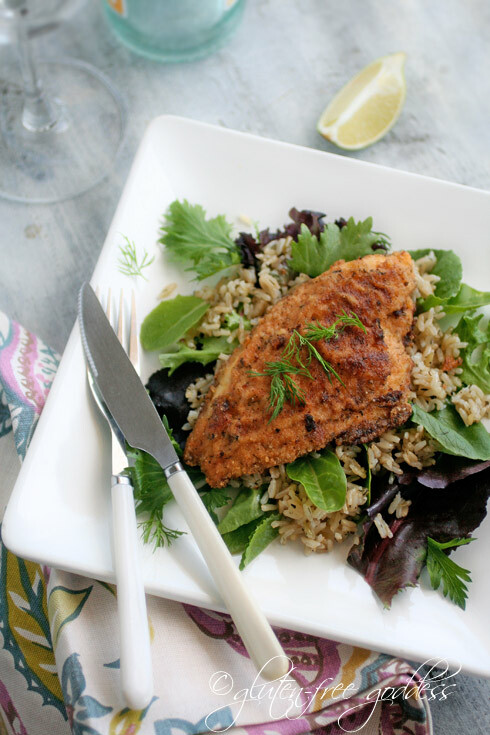 Crispy pan-fried catfish. Cool and snappy peanutty slaw. 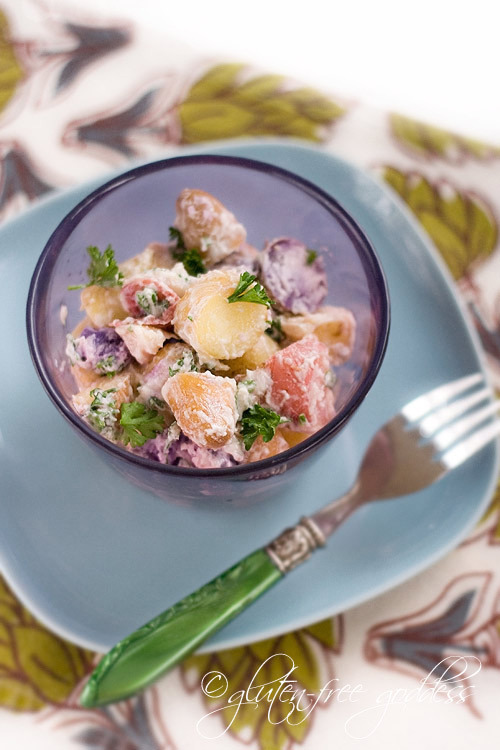 New potato salad in a vegan dressing. 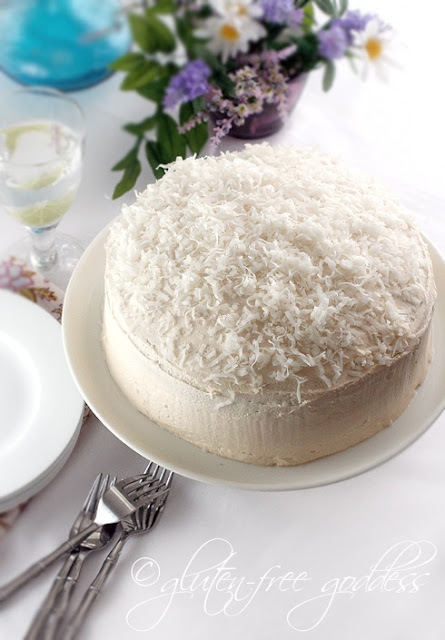 And celebration-worthy Coconut Layer Cake. The berries are ripening. Which turns a girl's thoughts to smoothies. I'll take mine pink. As in strawberry. So cool. Light. refreshing. I've made it with hemp milk, soy milk, and moo cow milk. All versions are delicious. Choose the milk that works for your body. 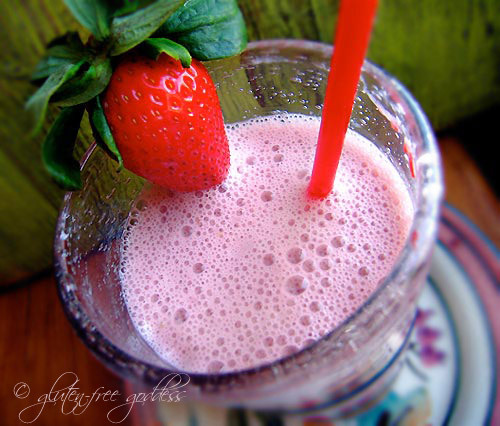 Get the recipe: Karina's Strawberry Smoothie. 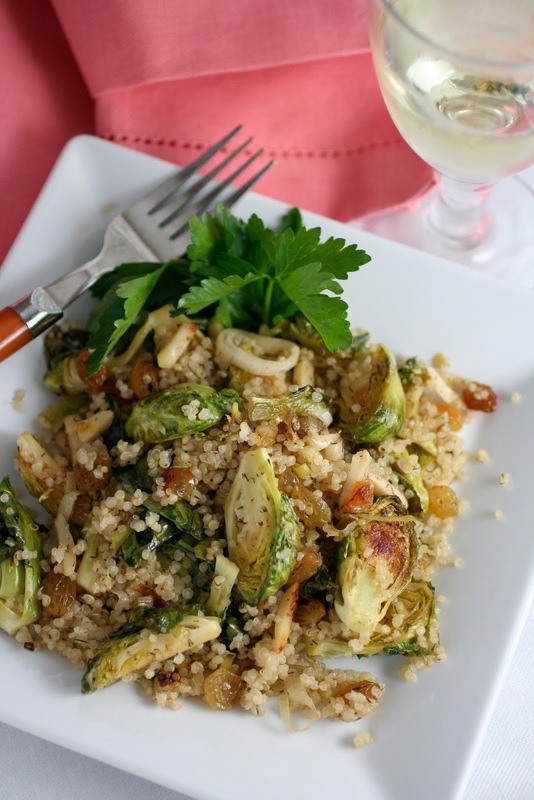 Make your appetizer a green one. Crackers and chips are so yesterday. Bring on the Spring Queen. Asparagus. I cook it just till tender crisp. Then I top it with my Maple Tahini Dressing and sprinkle it with sea salt. The flavors are lip smacking. One of my favorite simple dinners is pan fried catfish. So flavorful. The texture is lovely- flaky, and tender. Here I've made a crumb style coating with three gluten-free flours. It was crispy, light and golden. 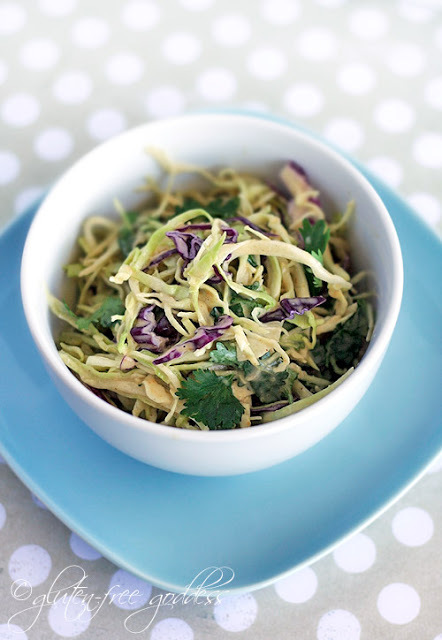 And what better to go with crispy fried fish than a cold snappy slaw with peanut dressing. No dairy or mayo in sight. This is slaw you'll be making all summer. So good. Tis the season for new potatoes- and these little heirloom gems are my favorite. The smooth- and dare I say- buttery taste of these tiny heirloom potatoes needs almost no seasoning. Seriously. I didn't add anything that might overpower their distinctive fresh potato flavor. You can always add a little diced red onion, if you like. But I suggest letting these potatoes shine. Finish your supper with a lovely Coconut Layer Cake worthy of company. Serve with tea and lemon. 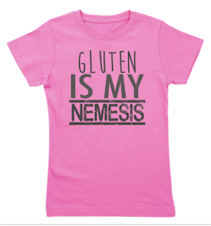 A slow walk after dinner can be the final touch to this gluten-free meal.